Apologies for the lack of a post Friday. I had planned on sharing more info on the amazing and enchanting Tenuta Lupinari (from last weekend’s Kaleidotour), but I was having way too much fun in Santorini. So I have rescheduled that post for this Friday. Until then, however, prepare yourselves for a barrage of Santorini photos this week and next (I have been furiously editing and trying to narrow down my favorites). But back to this post... How cute is this “Pardon My French Tee?” One of the members of my squad, Kelly, makes the most adorable, and perfectly cheeky, t-shirts and sweatshirts. This tee is super soft and comfortable and I love how it looks paired with my red gingham skirt and (faux) leather jacket. I have been pondering whether or not to invest in a real leather jacket while in Florence, but with so few traditional leather artisans left in the city, I can’t decide if it’s worth it. I will keep you posted. 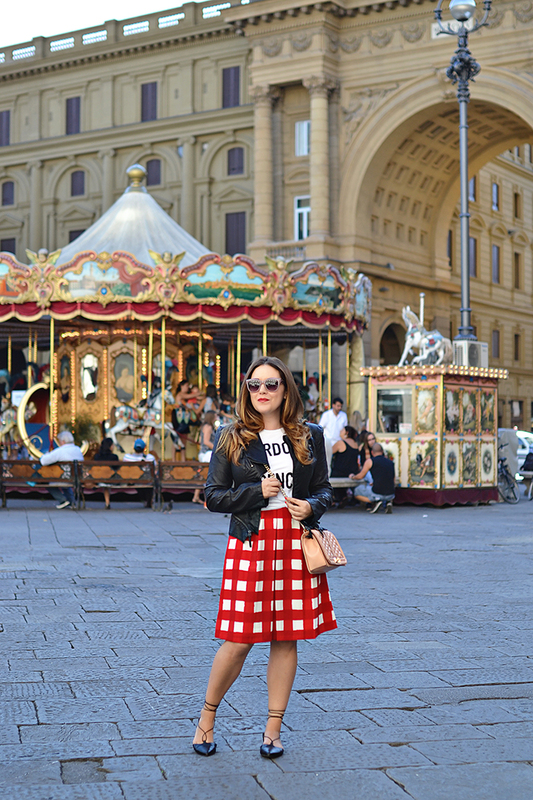 We shot this look in my favorite piazza in Florence, Piazza Republica, after downing iced coffees at nearby Gilli. It has been so nice in Florence and the perfect temperature for a light jacket, but not yet chilly enough to break out the tights, a.k.a. weather perfection.